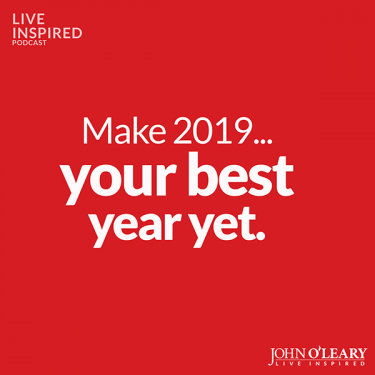 John O’Leary shares his secret to make 2019 ‘Your Best Year Yet’ on the Live Inspired Podcast. Today’s episode is about you. Specifically, how to make sure 2019 is absolutely your best year yet. My friends, these are just a few of the goals I set and then achieved thanks to this process. Join me to get clear on what you want to achieve personally and professionally in 2019 + set yourself up to make this your best year yet. *Live Inspired IN STUDIO with John O’Leary is a membership community where like-minded friends ‘come together’ online monthly + leave feeling better, encouraged, energized, calm, focused, capable + supported. Next week IN STUDIO, we’re creating blueprints to make 2019 our Best Year Yet. Registration is open for a very limited time. Register today so you can join us and make 2019 Your Best Year yet here. Get Jinny Ditzler’s book Your Best Year Yet here. If you enjoyed today's episode: Subscribe, rate & review on iTunes or wherever you get your podcasts. See you here next Thursday! Live Inspired with me daily on Facebook, Twitter, YouTube, LinkedIn, Pinterest, Instagram + get my Monday Motivation email. The post Live Inspired Podcast: Make 2019 Your Best Year Yet #119 appeared first on John O'Leary.